My 2019 Make Nine | Oh Sarah O ! I've been participating in the Make Nine Challenge, hosted by Rochell of Home Row Fiber Co, since 2017. What I like about the challenge is that it allows me to come up with a crafty strategy for the year, and later on I can reflect on how my priorities have changed from year to year. I haven't actually completed my whole Make Nine Challenge list since I began. In both 2017 and 2018, I only completed 4 out of 9 of my plans. What I've learned is that I am easily distracted by shiny new patterns and I'm more likely to complete less specific plans that allow for more variability. 1. The Fulton Sweater by Alina Sewing/ Design Co. is a pattern I fell in love with as soon as it was released. It looks modern, stylish and practical and it's the kind of garment that I can wear to work and on my days off. I'd like to sew up one in every color of the rainbow, but I'll be happy if I can make one this year. 2. An Andi Satterlund Pattern. 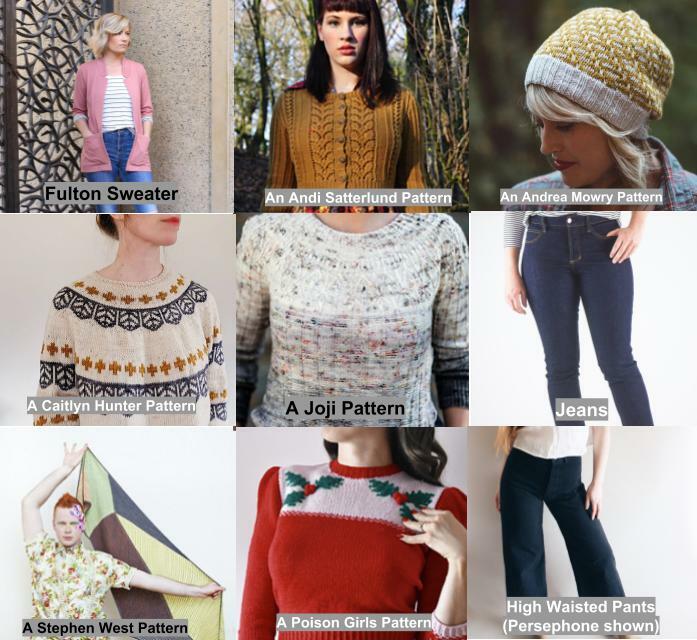 I've been a fan of Andi Satterlund's pattern's since I started knitting and I especially enjoy participating in the knitting/ sewing make-a-long she hosts each year with Lladybird. I definitely plan to add more of her patterns into my wardrobe. 3. An Andrea Mowry Pattern. I've been a fan of Andrea Mowry's patterns for ages and in 2018 I jumped in on Andrea Mowry's #FlouritegivingKAL over the Thanksgiving holiday weekend and realized that THAT was my one and only pattern I've knit by her. Luckily, my husband got me an Andrea Mowry pattern/ yarn kit for Christmas, so I aim to have more of her patterns knit up this year. 4. A Caitlyn Hunter Pattern. I knit up 2 patterns by fellow Oregonian, Caitlyn Hunter aka boylandknitworks, and they were my favorite and most worn sweaters of 2018. There are plenty more of her patterns in my queue ready to cast-on. 5. A Joji Locatelli Pattern. I haven't knit a pattern my Joji Locatelli pattern yet, but when her Spector pullover pattern came out in late 2018, I immediately added it to my library. I plan on casting it on soon. 6. Jeans. I bought the Closet Case Ginger Jeans pattern, fabric, and accessories in 2018 with the intention of sewing them up over the summer, but I chickened out. So this year I signed up to take a Ginger Jeans sewing class taught by Lladybird, so this is definitely happening. 7. A Stephen West Pattern. I participated in Kristy Glass Knits #doodlerkal in 2018 and had so much fun making that shawl! I'm hoping to try another to my collection. 8. A Poison Girls Pattern. I haven't made a Poison Girls, aka Amy Appel, pattern yet, but a lot of my favorite makers on YouTube, Instagram, & Ravelry have. These patterns offer a modern take on 1950s styles which I enjoy. Plus the Betty & Judy Lodge Christmas sweater is amazing! 9. High Waisted Pants. I pretty much wear some variation of pants and a shirt every day and would love to have several pairs of high waisted me-made pants in my wardrobe. I have seen some amazing Persephone pants by Anna Allen patterns, I have plans to make more True Bias Lander pants, and have some high waisted Big Four pants patterns in my stash as well. Are you creating a #2019MakeNine this year? Have you made any of the patterns on my list? Let me know in the comments below.